Derek was born in Kilmarnock Scotland in 1963, and began playing the flute at the age of fourteen. Having initially studied with Sheila Laing and Stewart Forbes he continued his studies with Sheila Cochrane at Napier University Edinburgh. And with Sheena Gordon (Scottish Chamber Orchestra). He has also been fortunate to have attended and played in master classes with such players as Wissam Boustany, David Nicolson, Lorna McGhee, Paul Edmond-Davis, Peter Lloyd, Ian Clarke and Sir James Galway. Derek played professionally for many years and was founder member and played with "Zonda Flutes" an award winning flute trio based in Glasgow. He also played flute with "Glasgow Wind Band one of Europe’s premier symphonic wind orchestras, until re-locating to Australia in 2008. Since moving to Australia Derek has quickly established himself as a popular music educator and flute teacher, he teaches in Sydney schools and is in demand as a flute tutor for band and orchestral Camps. He also teaches from his studio in Lane Cove. 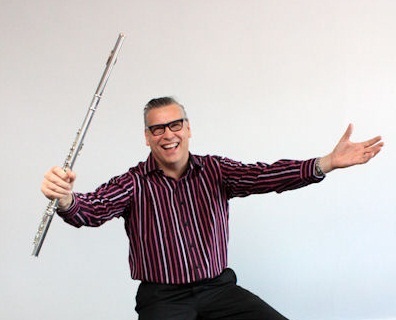 In 2010 Derek launched "Flute Connections" an organisation that provide professional flute workshops and events in NSW. Derek is an Associate of Trinity College of Music London and has a Diploma in Music from the Open University. He is the NSW representative of the "British Flute Society”, and is the membership secretary of "The Flute Society of NSW. "Derek Galloway is a terrific flute teacher and player, filled with creative energy and love for music and life in general. Derek is an enterprising and clever musician, also a lively, thoughtful and caring flute teacher. Mr Galloway has proved to be an important figure in the nation's flute community."